This information package will give you all the necessary information needed and teaches you how to become the best Wolt Courier Partner out there. After you master everything in this information package you should be ready to start earning money as soon as tomorrow! All of us eat – two to five times a day. Wolt is the world’s most advanced mobile interface for getting great food with the push of a button. 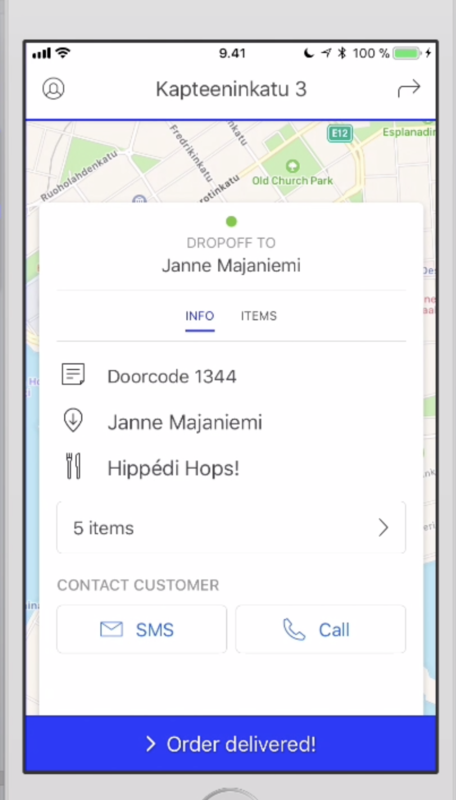 Wolt combines a clean, smooth app with a world-class food delivery service and it lets its users order their meal to be delivered, have it as takeaway, or to be eaten at the restaurant. Food is an experience. 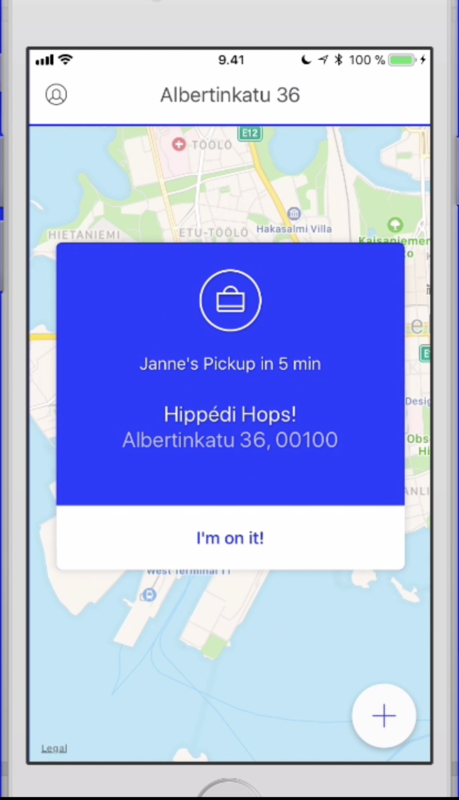 Wolt guarantees it's an excellent one – starting from the moment the user picks a restaurant and builds their order to getting it delivered to their location. As reliably and fast as possible. In 1–2 years, the home screens of our smart devices have one icon for getting food. Wolt is going to be that icon. As Wolt is the world’s most advanced mobile interface for getting great food, couriers working with us need to be the best as well. That’s why we want you to join us. "I want flexibility when I work." "I want to be able to drive last minute, change my hours, and drive anytime without scheduled hours." "I want to earn more per hour if I do more deliveries." "I want to earn more if I do longer deliveries." Once you’re accepted as a Wolt Courier Partner, you can go online whenever you want and start delivering and earning money. 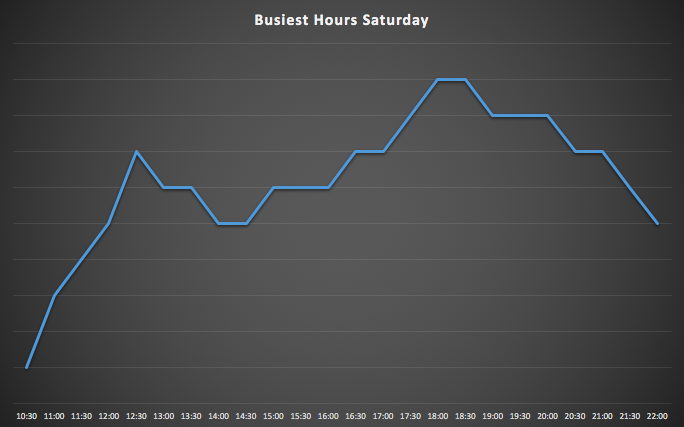 Sometimes, especially during weekends, we need to ensure that we have enough courier partners and that’s when we offer scheduled hours with guaranteed earnings. You can check if there are any available hours every Wednesday at 10.00 or 16:00. These days and hours are subject to change, so always double check with your Partner Support Representatives (PSRs) beforehand. 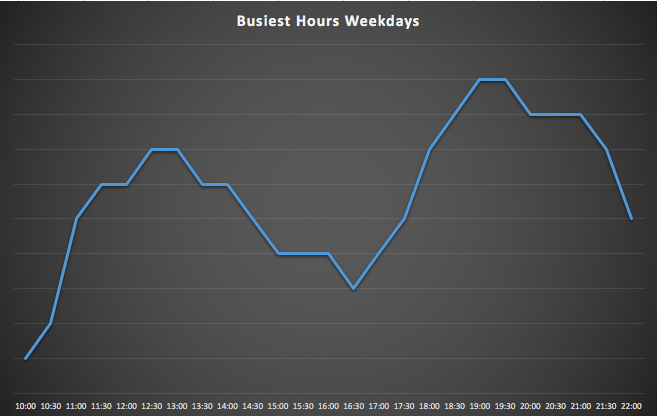 Take a look at the chart below to get a good idea on the flow of orders throughout the week. 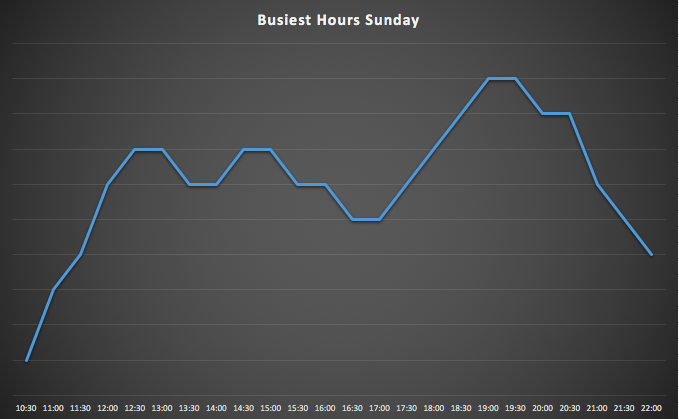 Being online during these hours is the best way to be as efficient as possible and also maximize your earnings. 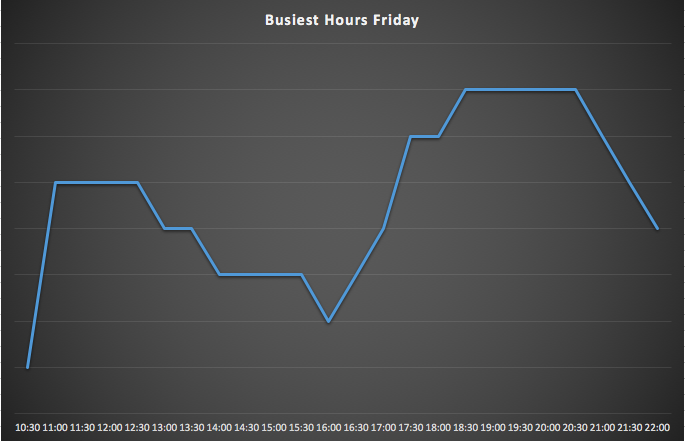 As you can see, the highest demand is on Fridays, during the weekends, and of course during lunch and dinner hours throughout the week. You will receive your earnings twice a month. Earnings made from the 1st -15th will be received on the 25th of each month and the payout is made on the 16th. Earnings made from the 16th - end of the month will be received on the 10th of each month and the payout is made on the 1st. 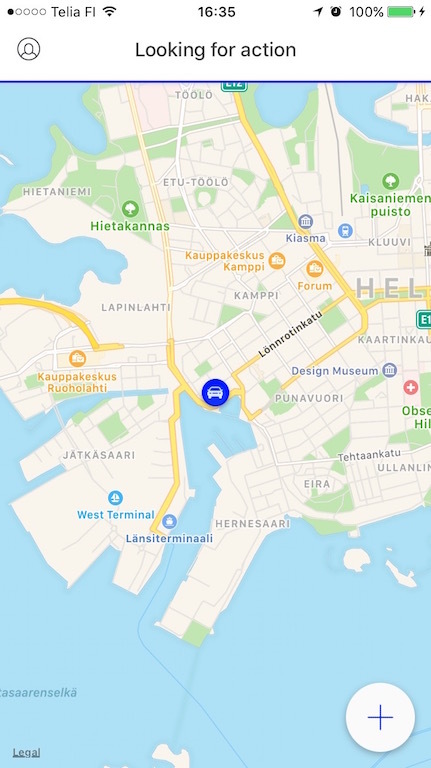 Below is a heat map of Helsinki city centre area. 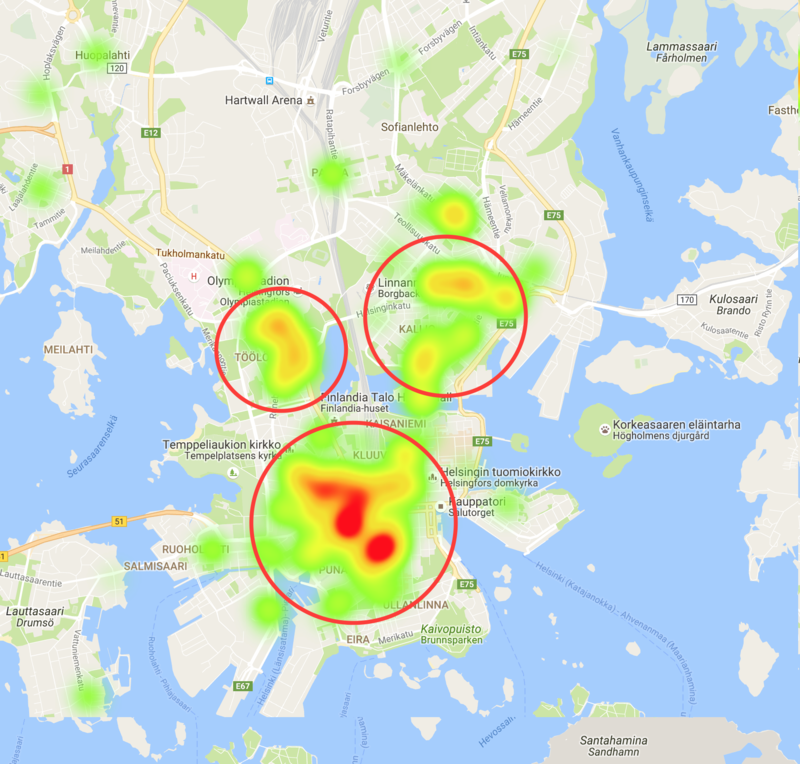 The areas inside the red circles indicate the most popular locations for picking up orders. The areas indicated by the red circles are areas where we recommend going online, and also a good return point after completing a drop off. We highly recommend positioning yourselves as close as possible to the heart of where the restaurants are located (hot spots). Hot spots are where there is the highest concentration of restaurants. You may always check with Partner Support for exact areas. Returning back to these hot spots means shorter pick up times, quicker task completions, and more deliveries done, thus more money in your pocket! As a Wolt Courier Partner you will need to learn how to use one smart phone application. Mastering the use of the Partner App is critical and will ultimately lead you to being more efficient and therefore allow you to earn more. The Partner App is used for receiving, accepting and completing delivery tasks. 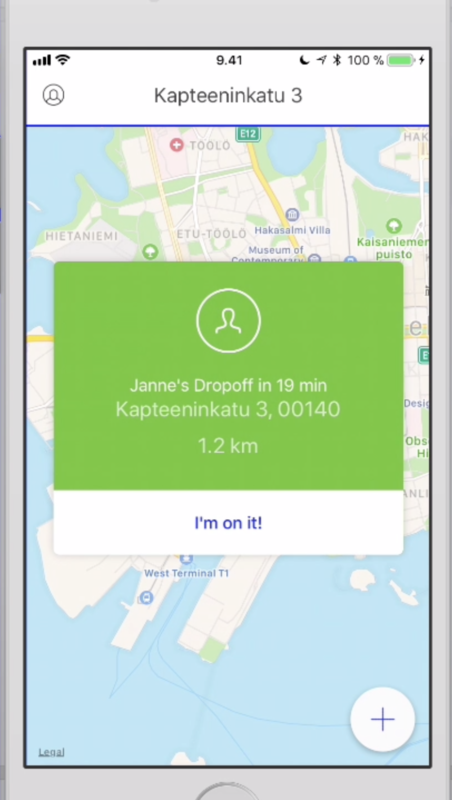 When you’re ready to deliver with Wolt, you can switch yourself online whenever you want and you will automatically start receiving delivery tasks in this application. You should also use the Partner App for live communication. You can chat with Wolt Partner Support Representatives (PSR) directly through the “Support” section of the app when you are online and making deliveries. - Notifying Wolt Support if a restaurant is late. - If you have to cancel your scheduled hours. - If you have a problem with your vehicle. - If you get lost. - And any other live pickup/drop off related issues. The Partner App is also used for claiming scheduled hours. Sometimes there is a possibility to take scheduled hours, because we need to ensure that we have enough partners on the roads. If we publish scheduled hours, you'll be able to book them via the Partner App in the "Scheduled hours" section. Again, you can check if there are any available hours every Wednesday morning at 10.00AM. These days and hours are subject to change, so always double check with your Partner Support Representatives (PSRs) beforehand. 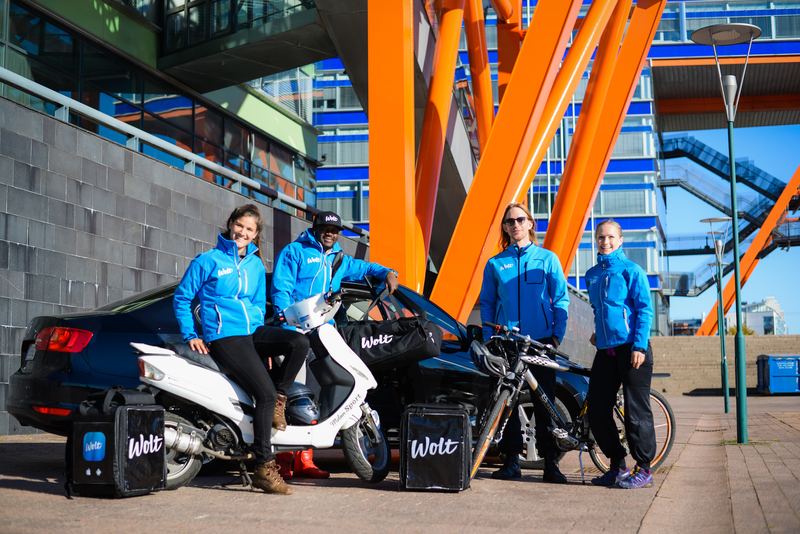 Working as Wolt courier partner requires that you have your own car, bike or a scooter. Wolt does not pay you for using your own vehicle. One of the most important aspects of being a Wolt Courier Partner is getting the food from the restaurant to the customer, so that the temperature and the packing of the food is the same as it leaves from the restaurant. Once accepted as a Wolt partner you will receive gear that is to be used to deliver orders, mainly food. The importance of knowing how the gear works will ultimately determine the rating that the customer will give you. Car, bike or a scooter. A heating bag for warm food. A cooler bag for cold food. Always take the heating or cooler bag with you to the restaurant and to the customer when picking up and dropping off orders. Pack warm food into the heating bag. Pack cold food into the cooler bag. Do not mix hot food with cold items. Meaning don’t put cold drinks with the warm food. Treat every order like it’s your baby. Pack and carry the orders carefully, just like it was your own. If food or drinks spill in your heating or cooler bag, communicate this to the Partner Support Representatives with no delay. You will get further instructions on how to proceed. If you remember these points, you will do just fine when delivering with Wolt! Phone charger, so your battery doesn’t die. Heating and cooler bag to keep the food temperature and packaging perfect. Giving five star service we highly recommend that you heve Wolt clothing on so that restaurants and customers recognise you. Wolt and couriers are a team and a team is only as strong as its weakest link. Small problems cause chain reactions which will affect other couriers as well, so make sure you know how to use the equipment and that you communicate in a timely manner if something goes wrong. We want every Wolt courier to be proud of being a part of Wolt. Wolt most definitely is proud of the couriers we're partnered with. Therefore, we all should expect professional appearance and hygiene when representing Wolt. Restaurant staff, customers and people around the city see you as representing Wolt, so we highly recommend using the gear. Nothing that displays political or religious messages. 1. Your appearance is professional. 2. You have all the gear and full battery in your phone. 3. You’re inside the delivery area illustrated below, (and close to a hot spot if you want to increase the likelihood of receiving a task quickly). Now let’s walk through one delivery. The application you’ll use for this is the Partner App! 1. Receiving and starting a PICK UP task. - Delivering the order and completing the drop off task. 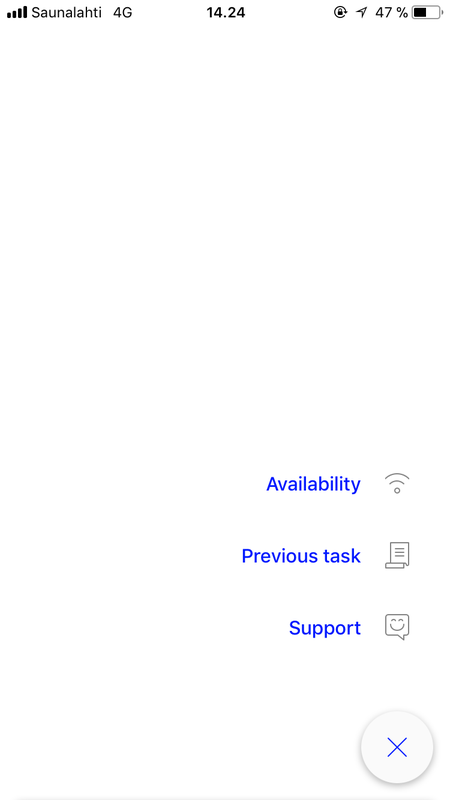 First step to start receiving delivery tasks is to open the Partner application. Remember to have your location settings turned on and to have Power save mode turned off. Then go online by pressing the + icon on the bottom right corner of the screen and press "Availability." Then swipe "I'm available" to the right. 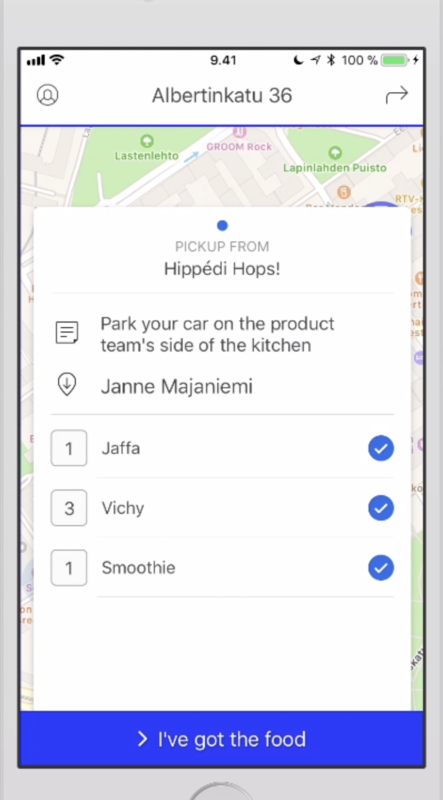 Once you're online and inside the delivery area, you will automatically start receiving delivery tasks. It will say "Looking for action" which indicates you've successfully turned yourself online as pictured. For each delivery, you’ll receive two tasks. A pick up task which pings/pops up on your screen as pictured. The pick up box is always blue. 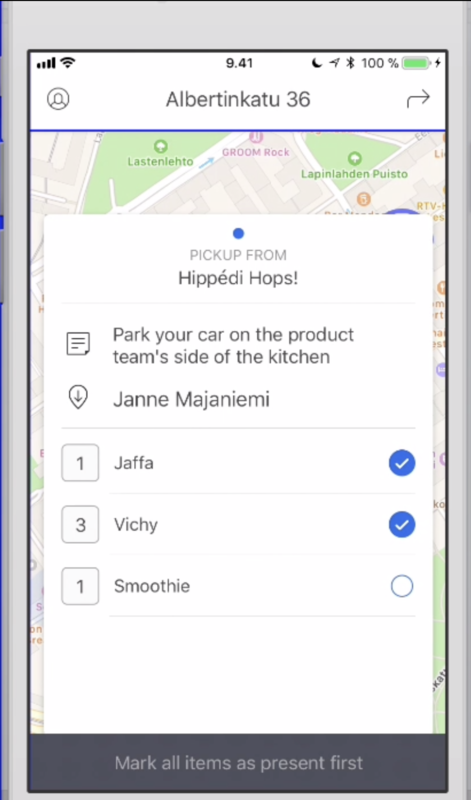 You'll also receive a drop off task which is only visible after you have successfully completed the pick up. As you’re always going to have to pick up the order before delivering it, you’ll always start with the pick up task. Keep an eye out for double/bundled tasks. It'll be explained further, so keep reading! Now that you've acknowledged the task, remember to check the pick up time. The pick up time is the time the order will be ready at the restaurant. It's important to familiarize yourself with all the details (pick up time, restaurant's name/address, customer's name) before entering the restaurant. If anything seems odd, let the PSRs know. Go through the details quickly and start the task by pressing "I'm on it." This will indicate that you've accepted the task and you're on the way to the restaurant. There's a menu for more options that shows further details, such as the items the customer has ordered as pictured. To navigate to the restaurant, tap the "arrow" icon on the top right. You can select a default navigation app in the settings menu under Navigation. Locate the restaurant and find a safe place to park. Enter the restaurant, always with your heating or cooling bag. Be polite towards everyone, the customers inside the restaurant and the staff. State that you're there to pick up a Wolt order and mention the first name of the customer, so that the staff knows to give you the correct order. Once you receive the order, double and triple check that you have all the correct items. You have to tick all the boxes that indicate the different items a customer has ordered before swiping the order as picked up. Refer to the boxes pictured. The most common negative feedback towards Wolt is forgotten items in an order. You can change this! Once you have the correct order, place the items carefully in your heating or cooling bag. Make sure the order doesn't move around and remember to separate hot items from cold! Thank the staff and complete the task while still in the restaurant by swiping "I've got the food." Treat people like you want yourself to be treated! After completing the pick up task, you’re left with the drop off task. Remember, that the drop off task is always the part where you drop the order to the customer. You'll have a similar ping/pop up as the pick up task, but the box is in purple. It's recommended to only start the drop off task once you're in your vehicle. Position the heating or cooling bag properly so that the food doesn't move around. Then start the drop of task by pressing "I'm on it" as pictured. Once you have started the drop off task, the customer gets a notification that a Wolt courier partner has picked up the order and is on the way, so make your way without any delay. Just like the pick up task, you can tap the arrow icon to navigate to the correct location. Customers very often leave special instructions for you, such as a door code. These instructions are always visible from the drop down option similar to the pick up task as pictured. If you can't locate the customer, you can call. Never do this if you're lost, only if you're 100% sure that you're at the correct address. There is a phone proxy in place, so your number and the customer's number is protected. If you're lost, contact the PSRs, not the customer. Remember to always read through the instructions carefully as it will help you be more efficient. Ok, now you're arriving to the customer. Here's a step by step guide to ensure you'll receive five stars from the customer. Navigate to the customer's address, spot the correct apartment or house number, and find a safe place to park. Check all the special instructions carefully; door codes or buzzer numbers. Customers very often leave detailed information under the special instructions. Never make the customer come down to get the order. Wolt is a door to door service! If the customer says they'll come down themselves it's ok. Always take the heating or cooler bag with you to the customer and take the order out only after the customer opens the door. Remember to carry and treat the food like it’s your baby! Mention that you're from Wolt. Tell the customer to enjoy their meal and wish them well. Remember that every situation is different. Be yourself and adapt to each situation uniquely. Never walk into the customer's apartment. Avoid any physical contact with the customer (even a handshake can make a customer feel uncomfortable). Unless they initiate it. People are different, respect those differences. Congratulations! You just made your first delivery and made someone's day a lot better. The task is completed when the customer receives the order, so once you have done that, go ahead and swipe "Order delivered." You will then be returned to the main map view where it says "Looking for action." You will most likely have the next delivery waiting for you! Now you should be able to complete home delivery orders all by yourself! You can do this in the middle of a task to avoid receiving a potential second task if you really need to go. If you know in advance that you want to stop at a specific time, use the "At a specific time" feature to ensure you won't be receiving any tasks that will take you past the time you chose. Make sure to set the time 15 minutes before your desired offline time. 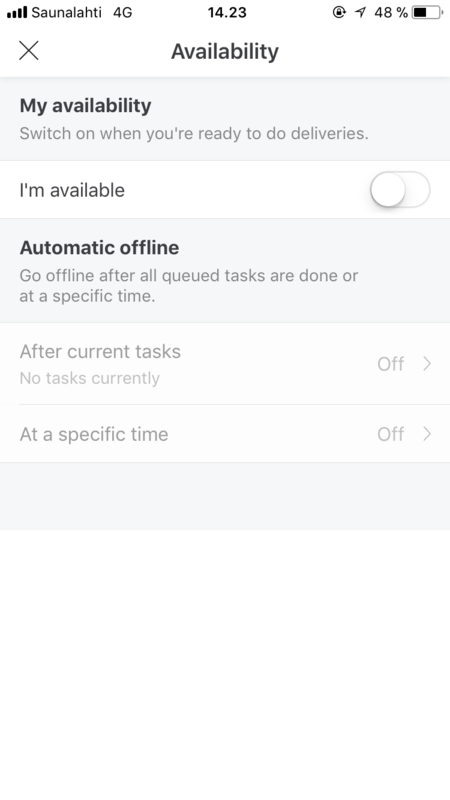 The "After current tasks feature" will allow you to set yourself offline and not receive any additional task on top of the ones you currently have. Keep in mind that you can only use the Automatic offline features once you have gone online. You may of course simply swipe "I'm available" off and have the PSR remove any task that hasn't been started yet. 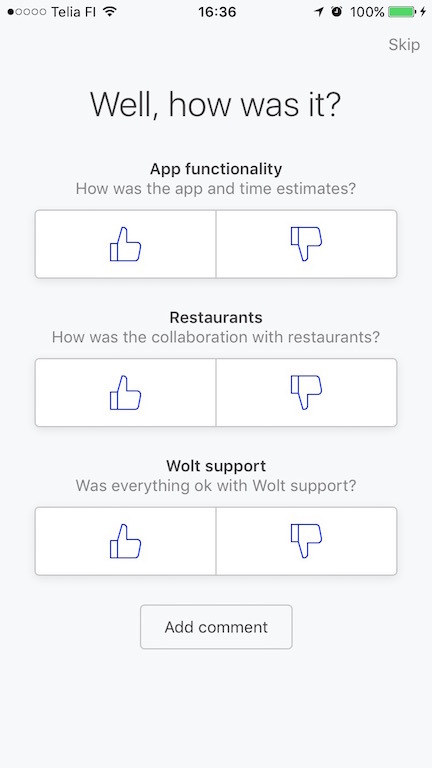 Once you have successfully gone offline, you can give feedback on the App’s functionality, the restaurants, and communication with Wolt support. We highly recommend you to leave honest feedback! We review all feedback in order to provide the best possible experience! The "plus" icon (bottom right corner) takes you to a mini menu where you can access the "Support" chat to reach the PSRs. There is also your profile icon on the top left corner that takes you to your personal menu. You can view your Stats, Earnings, Scheduled hours, and access your settings to customize your default navigation and the routes for cars or bikes. There’s one more important thing before you’re ready to start making deliveries with Wolt. Sometimes you need to pick up two or more orders before you make the deliveries to the customers. These are usually from nearby restaurants, to customers who live close to each other. You’ll be able to recognize you have a double task only after you complete the first pick up. Another pick up window will pop up with restaurant’s address given. It’s important to complete pick up tasks while still in the restaurant. This is because you may have a double task from the same restaurant, so in order to avoid going in and out, complete it and check the next task before moving. If you learn how to complete bundled deliveries efficiently, you will enable yourself to earn significantly more money. This is because you will always be paid for each unique delivery regardless if the orders are from the same restaurant and go in the same building. Five-star tip: When handling multiple orders at once, always make sure you’ve organized the packaging well, and you’re handing out the right items! If picking up from the same restaurant, you may ask the staff at the restaurants to write down the customer’s name on the package to avoid confusion. Communication is the key link to success between Wolt and its courier partners. If we can’t communicate together, delivering with Wolt will be impossible. Therefore, we’ll go through clear communication guidelines to ensure that you know the pillars in communication. You were in an accident and not able to continue. You’re lost and cannot find the pick up or drop off address. Use this number: 09 42450258, yes it is toll free. Is meant for non-live matters meaning that whenever you’re not online making deliveries, your primary way of contacting Wolt is by email. You can email us about anything e.g. payments, service agreement related questions, tax cards updates, feedback etc. Make sure you read your own email as you will receive important information such as payment slips in the email you provide us! If you plan on coming to the office, make sure to set up an appointment via email or phone call. Delivering orders can be very hectic and we all make mistakes. We’re humans and we learn from them, so don’t worry when you make your first mistake. As long as you know how to react when something goes wrong and you learn from mistakes, you’ll do just fine. Now as there are four moving parts in a delivery; The courier, the customer, the restaurant and Wolt – it’s not necessarily your fault if a mistake happens. But it’s ultimately up to you how the mistake is fixed. Below you can see a list of most common problems our couriers face and how they've solved them. How to react: Be polite and apologize for the inconvenience to the customer. Tell the customer politely that they can reach Wolt Customer Service through the Wolt application and everything will be fixed there. How to react: Be polite and apologize for the inconvenience to the customer. Remember to never get into an argument with the customer. Be humble and tell the customer politely that they can reach Wolt Customer Service through the Wolt application and everything will be fixed there. How to react: Contact Wolt Support immediately. Do not deliver any orders if the packing has failed. It doesn’t matter if it was the restaurants or your fault – we never deliver orders with broken packing due to hygiene reasons. If your bag is dirty, you may take it to one of our cleaning services and they’ll provide a fresh bag to continue deliveries while they clean the dirty bag. PSRs can provide the address upon request. How to react: The longer you wonder around the colder the food gets. Check the special instructions in the task, if you still can't find the correct location, contact Wolt Support. Never contact the customer if you are lost. How to react: Depending on the seriousness of the accident, call the emergency center and then if possible Wolt Support. How to react: Close the app and restart it. If it still doesn’t work, restart your phone or go to airplane mode and back. Also check that your location settings are turned on. Contact the PSRs if the problem persists. How to react: Accept the task and head to the restaurant asap! If you're unsure how to proceed, contact the PSRs asap. How to react: Be polite and wait. You’ll have a prompt to mark the restaurant as late once the pick up time has elapsed. You can mark the delay in 5 minute intervals. Politely ask the restaurant staff how much extra time they need and mark the delay accordingly. You will receive waiting compensation from PSRs for extended delays. Wolt measures restaurant preparation times and we do everything in our power to reduce your waiting time. How to react: Contact Wolt Support immediately and we’ll send an in-app message to the customer. In-app message means that our Support sends a message to the customer inside the Wolt application. If you cannot reach the customer after 15 minutes of waiting, you can continue to the next task. Always wait for feedback from the PSRs before moving on to the next task. How to react: Stay calm and do not get into an argument with the customer. Simply navigate to the correct address and let Wolt Support know and we’ll make sure you will be compensated for the actual distance. How to react: Check the address details carefully and if you notice that there is clearly information missing, call the customer to ask more specific instructions only if you're sure you're at the correct address. There are certain things that you should never do as a Wolt courier. The list below will in most cases lead to the termination of our cooperation. - Entering customers apartment without permission. - Asking a customer or restaurant staff out for a date. - Calling or sending text messages to customers after completing the delivery. - Stalking customers or restaurant staff. - If a Wolt courier violates customer privacy at any point, it will lead to immediate termination of the contract and most likely to police actions as well. Using customers contact details for anything else except completing a delivery. - It is strictly prohibited to contact any customer at any point after completing the delivery. - It is strictly prohibited to store any phone numbers, names or addresses after completing the delivery. Everything below will result in an initial discussion and further action if repeated. Picking up or dropping off orders without the heating or cooler bag. Using another courier partner's profile or account to perform deliveries. Being rude to customers or restaurant staff. Getting into an argument with customers or restaurant staff. Talking on the phone while picking up or dropping off orders. Constantly missing items from orders. Smoking or drinking alcohol with Wolt gear on. Smoking in the car while making deliveries. Do not eat orders that you’re picking up, we will find out. "Be motivated to work hard and care about making people happy." "Have a positive attitude and smile a lot." "Master the Partner App as it’s your most important tool." "Stay focused throughout the day." "Always use your heating and cooler bag." "Pack orders very carefully, just like it was yours." "Never get into an argument with a customer or restaurant staff." "Make sure you have all the gear ready before going online." "Check orders at the restaurant." "Be pro-active and learn city streets and restaurant locations." "Position yourself around areas with popular restaurants. Refer to the heat maps."